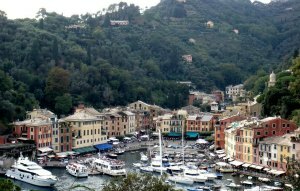 Portofino Italy: Travel Information Resources and Tips. Portofino Italy is a small fishermen village, appreciated by the artists, always attended by celebrities from the world of entertainment, culture and finance. It lurks at the bottom of a natural creek, wonderfully sheltered from the sea. In the woods, the colorful houses create a cheerful contrast to the crystal clear and blue water. This rocky promontory, dominated by Mount Portofino (altitude 610 m - 2,000 ft), is one of the most attractive landscapes of the Ligurian Riviera (IT: Riviera Ligure) in the region of Liguria, in the north-west part of Italy, with a lovely light filtered by the sea atmosphere. The walk to the lighthouse (about 1h w/return). It is of incomparable beauty, especially in the evening when the setting sun lights up the Gulf of Rapallo. After going up the steep street that rises from the port, you will reach the church of San Giorgio (lovely view from the terrace) and leaving it on the right, you can continue to the lighthouse. Another path, paved with bricks, connect on the hillside Paraggi to Portofino also offers views of rare beauty. At Paraggi, the old Benedictine monastery of Cervara, now privately owned, hosted celebrities, princes and popes, when the storms forced to take refuge in Portofino. Santa Margherita Ligure, elegant seaside resort with pleasant climate, it is also a good center for excursions in the peninsula of Portofino. Nice scenic route (by car). San Lorenzo della Costa, its church houses a triptych of a Master of Bruges (1499), depicting the Ressurrezione of Lazarus, the Martyrdom of St. Andrew and the Wedding at Cana. Portofino Vetta (alt 450 m 1,476 ft) - 2 km ( 1,25 mi) starting from the Via Aurelia. The southern end is a National Park.